The lively anthem that will have the festival participants jumping with joy is called Joyful Generation. 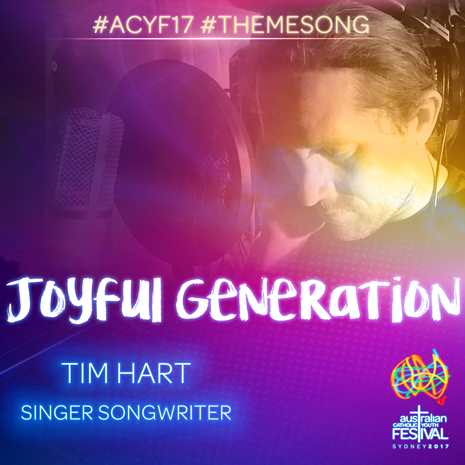 Tim Hart, who lives in the Southern Highlands in the Wollongong Diocese, was chosen to develop his song for the festival from among applicants from across the country. 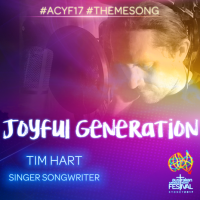 Applicants were challenged to capture the Australian Catholic Youth Festival theme “Open New Horizons for Spreading Joy” in their compositions. Mr Hart, a singer-songwriter, primary school teacher, music minister, husband and dad, took his inspiration from his experience as a pilgrim at World Youth Day 2016 in Krakow, Poland. “Trying to capture the essence of Christian joy, I kept coming back to Pope Francis’s message. These words made us feel like we were deeply loved,” he explained. All involved after the long process of choosing, developing and recording the song are excited to present Joyful Generation, making it worth the wait. Mr Hart thanked the coordinator of the development process, Simon Hyland. “It has been awesome working with Simon, who has great musical talent. He has been so encouraging and supportive throughout the process and helped guide the song into the ‘upbeat, can’t-help-but-get-on-your-feet-and-shout-it-out’ vibe,” he said. The three-day Australian Catholic Youth Festival will feature music, workshops, forums and worship at Sydney’s Olympic Park from December 7-9. It boasts a stellar line-up of international and home-grown presenters and performers. The Festival will conclude with Mass in The Domain at 6.30pm on Saturday, December 9. With tens of thousands of Catholics expected to attend, it will be Sydney’s largest Catholic Mass since World Youth Day in 2008. Joyful Generation can be accessed by clicking here.